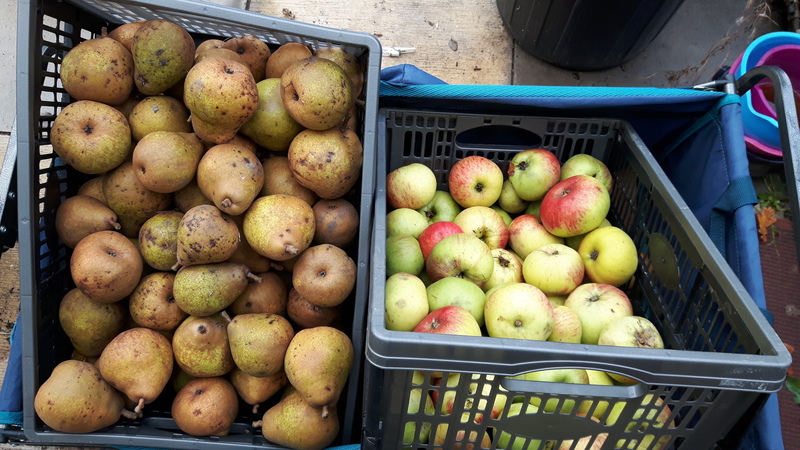 Well in my last post I said I’d tackle the apples and pears the next day, suffice to say that turned into the next week or two! The job still isn’t done though, the apples are resisting coming off the tree, at least the ones I can reach, but yet still falling to the floor in the masses! At least the pears are completely done. 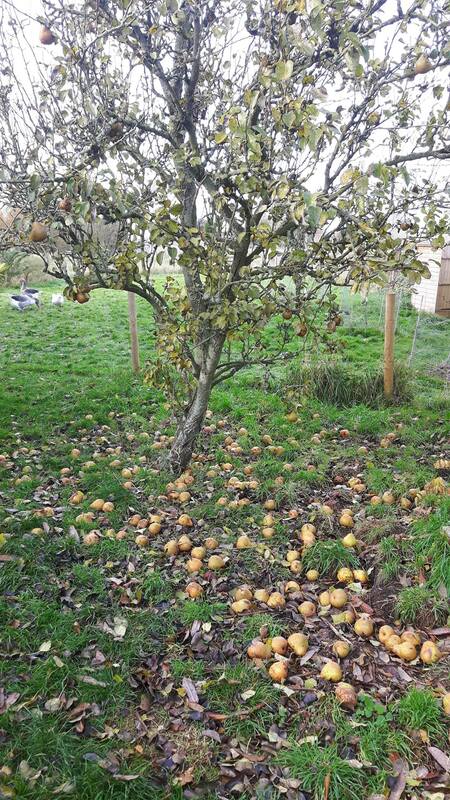 The pear tidy up was daunting, There were so many on the floor. Pretty much all of the Conference pears were no good, they were cut or eaten in some way, some had started to rot but they still needed to be cleared up. I roped Chi in to help, she was very good at picking up the bad ones and carrying them off to the bucket for me. As a bonus it tired her out enough to fall asleep whilst eating a pear I picked from the tree. Time to relax and enjoy the produce! The Williams pears were much more worthwhile. They are harder so a lot less had been damaged by falling. The ones that were damaged quite often had a split in them from the force of falling off. We did a little experiment with some of these and turned them into pear juice. This is something I’ve wanted to for a while but we didn’t actually realise we had a juicer until Sam stumbled across it in the stuff that is still waiting to be unpacked. The juicer was quite small though and I had to cube the pears so that they would fit into the hole on the top. That was horribly time consuming. Then one of the hooks to hold it all together fell apart, the plastic must have been made brittle from age and being stored outside. Despite that we got some nice juice out of it, certainly a way to use the more worse for wear windfalls. I did a brief google on preserving pear juice but the best I found only gives you two weeks. We did it (heating juice to 80C for 20mins then pouring into sterile bottles) but I’d like to get longer storage if we did larger quantities. I’m tempted by the proper pasteurisers too. The juice was really tasty though and we didn’t add any sugar, just a bit of lemon juice to stop the colour change (it didn’t work). I don’t actually have a picture of the finished juice though! I’ve been making my usual host of crumbles, apple and plum, apple and pear as well apple, pear and raspberry and I think I’ll be experimenting with adding in other red fruit from the freezer as I quite like the colour change. I’ve tried to mix things up a bit as well though. Last year when we got lots of pears I printed off a recipe for a pear pancake and a pear tart. I tried both of them. I’m not 100% sure that my baking skills are up to scratch though. My pear pancake was more of a pear on a bed on baked custard and my tart was like a very dense sponge cake. It was so awful I didn’t even take a picture, although I did eat it all! I need to find more easy baking ideas for pears (and apples). If you have any favourite recipes let me know! I’m also hoping to make a dent on the pear haul by trying pear wine again this year. It went horribly wrong last year and we binned the lot. I’m gonna try again with vitamin b and citric acid added and cross everything. The problem is that we have so many chopped up pears in the freezer still from last year and I’m just not getting through them with my baking. A few that I gathered 3 weeks ago have gone bad and I don’t want this haul to do the same. As I said the apples are still going. I’ve pretty much only focused on the cooking apples, and cooking apple tree #1 has barely fruited this year which had made it more manageable. We have 3 different eating apples in fruit at the moment though and again I’m nowhere near being on top of those. We’ll put some cooking apples to wine next week when the fermenters are free again but I really should do something with the eating apples. We did do dried apple rings with the Beauty of Bath apples so I might do that with the other eating apples, get more use out of the dehydrator too. I’m currently eyeing up some crushers and presses which have a black friday offer on and I’m sorely tempted. The one thing I do want to do is some apple sauce, I still can’t believe that with all the apples we had last year, and all that are still in the freezer, I’m still buying Tesco applesauce! PS if you like reading these posts follow us. The link should now be on the left if you’re on a computer or below if you’re on your mobile. 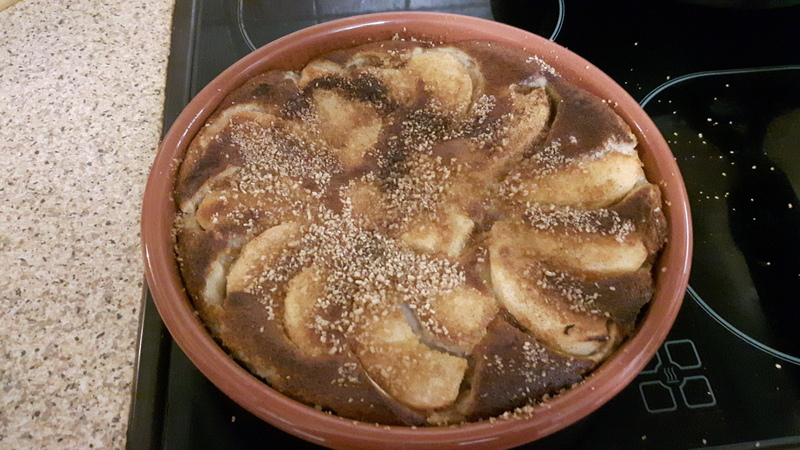 Pear, apple and ginger crumble with soy vanilla ice cream…. Dried Apple rings sound like a great idea, and you could easily bag them up as presents or for sale. Haven’t tried ginger, I’m a bit hit and miss as to whether I like it or not lol. Will give it a go on a small one. Do you mean the Finnish steamer juicer? We haven’t tried that yet, looking forward to having a berry crop next year to try it on. I don’t think it works well on hard fruits although I did see one place saying that you could use it with very small apples. We did some dried apple rings with the beauty of bath and they were ok the day we did them. After about a week though they started fizzing in the bag so we can’t have done them long enough. Dehydrating seems much more of an art than a science! Once we crack it though it’ll be great. We use to put also juices into deep freezer as well all the wild berries and garden berries we pick. I even made apple slices and put them there, so they are ready to make an apple pie whenever you want to bake it. We’ve got cubed apples and pears in the freezer for pies and crumbles etc, we haven’t tried freezing the juice yet, although I think we may end up doing that we don’t have much space to store lots of bottles. That being said our freezers are getting full so we may not have much freezer space either. I think I need more freezers and a bigger house! You could make lollies with the juice or I’ve always fancied trying to make healthy baby biscuits like the organix gingerbread men, made with grape juice to sweeten them. I bet Apple or pear juice would be just as good. I’ve made this before and it was really light and tasty.